Mini Turkey-Lentil Meatloaves are packed with protein, vitamins, and iron. Gluten-free, dairy-free, and freezer-friendly too, these bites are the perfect size for little hands. At nearly 14 months old I think it’s safe to say we’re entering toddler territory. Land o’ sippy cups, snack traps, tentative steps, first words, and new foods. 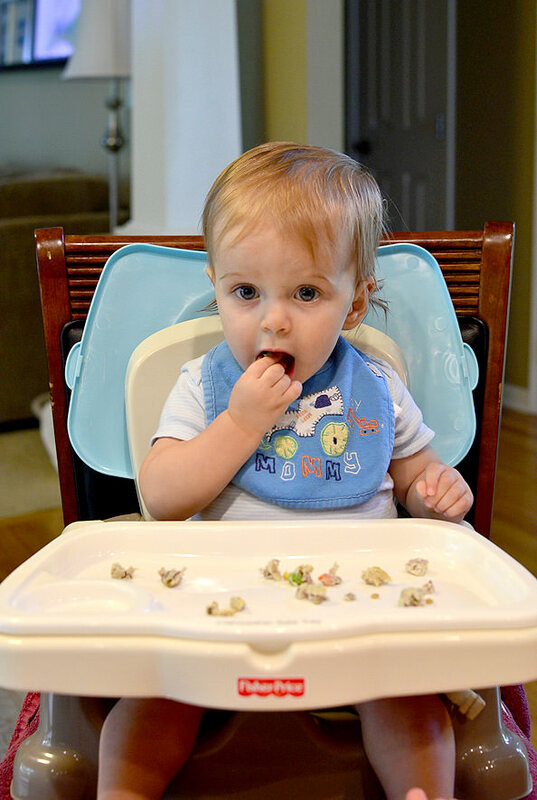 We’ve been feeding Lincoln more “real food,” aka foods Ben and I eat for our meals, than ever before but it’s also fun to come up with new toddler recipes that are perfect for little hands, like Mini Turkey-Lentil Meatloaves. Despite his tiny size, Lincoln takes after his Mama in that he LOVES to eat. Like, this child must have a hollow leg because I swear he eats more than I do and that’s saying a lot. 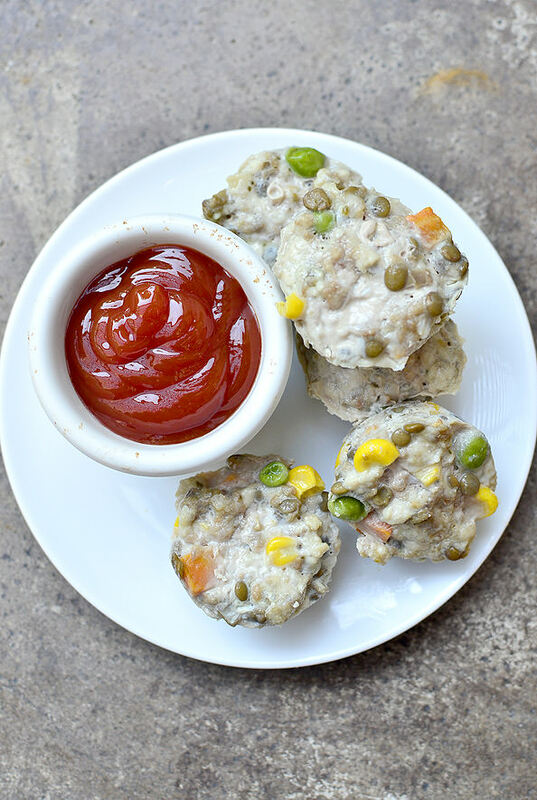 One of his favorite foods to devour are these Mini Turkey-Lentil Meatloaves which are so simple to whip together, gluten-free, dairy-free, freezer-friendly, and packed with protein, iron, healthy fats, and fiber. 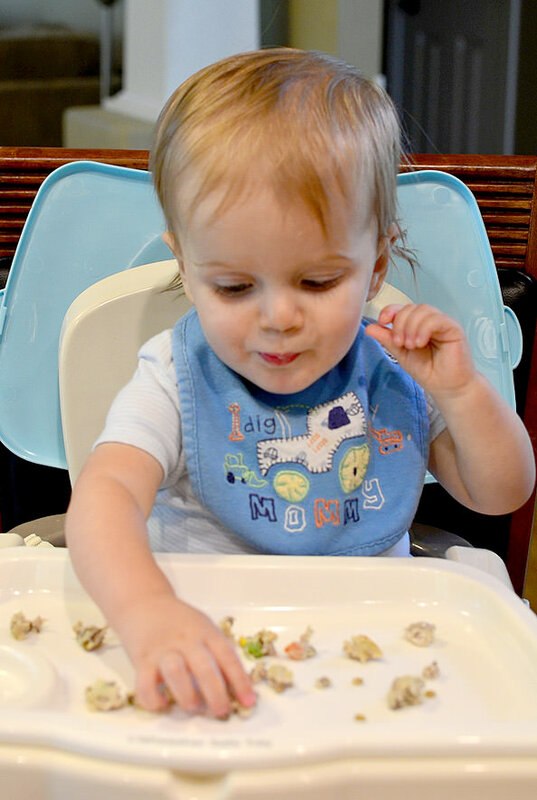 I created the recipe several months ago when we were ready to quit feeding Lincoln oatmeal (or should I say battling with him to eat his oatmeal – he got over it quick!) but wanted to make sure he was getting enough iron. He eats fortified bread (he does not eat gluten-free,) and lots of beans and greens, but I wanted an easy go-to that I could make in a big batches then freeze and easily reheat. 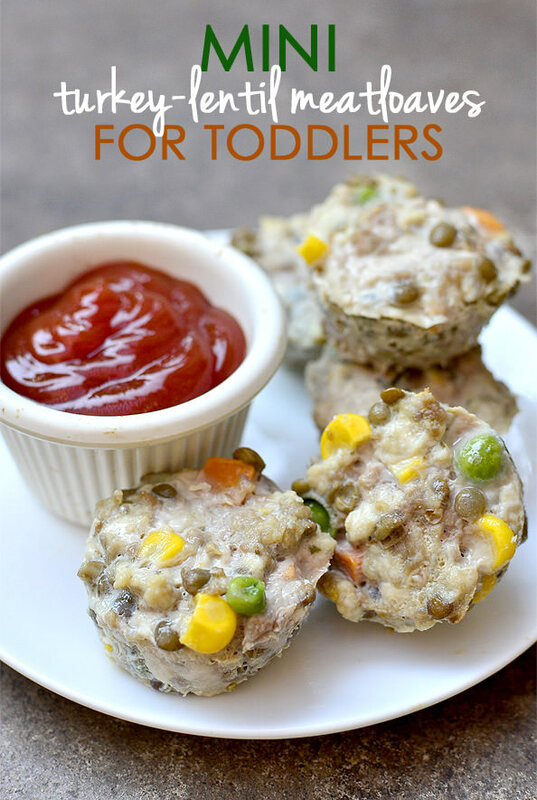 Mini meatloaves for toddlers totally fit the bill! 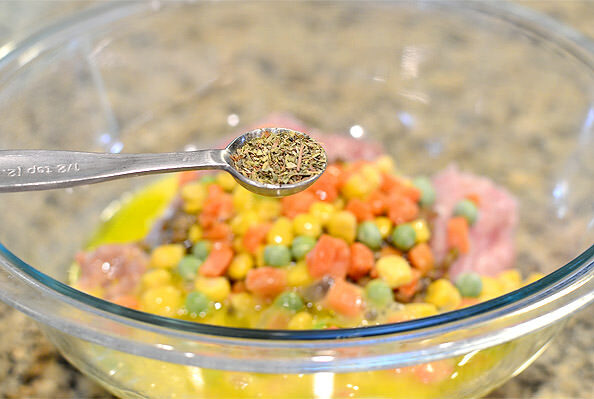 Ground turkey breast and thighs are mixed with cooked green lentils, frozen veggies, an egg, extra virgin olive oil and a pinch of seasoning then baked in a mini muffin tin so they’re the perfect size for little hands. At 13.5 months old, Lincoln will eat 3 for dinner (cut into hunks for now,) paired with maybe steamed sweet potatoes, pasta tossed with extra virgin olive oil, some sort of fruit (mandarin orange, cut grapes, sliced blueberries, etc.) and Cheerios for dessert, of course. It’s a well-rounded meal that keeps him full all night long. 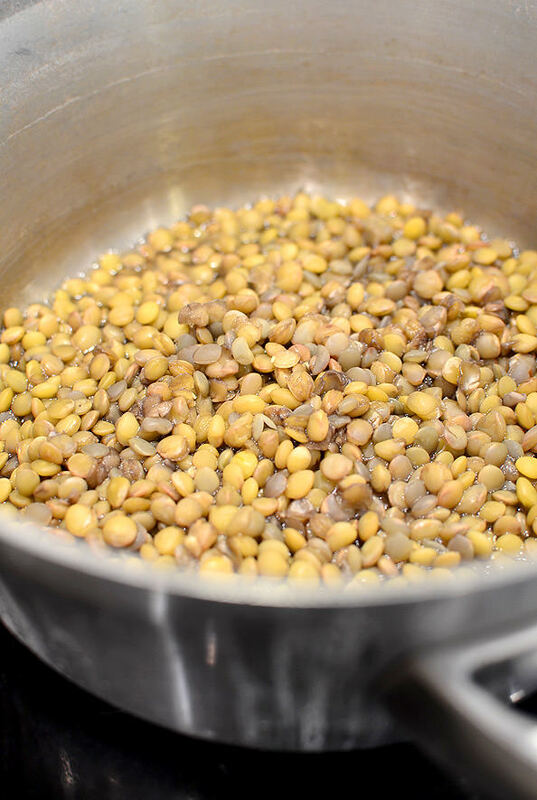 Start by cooking some green lentils. 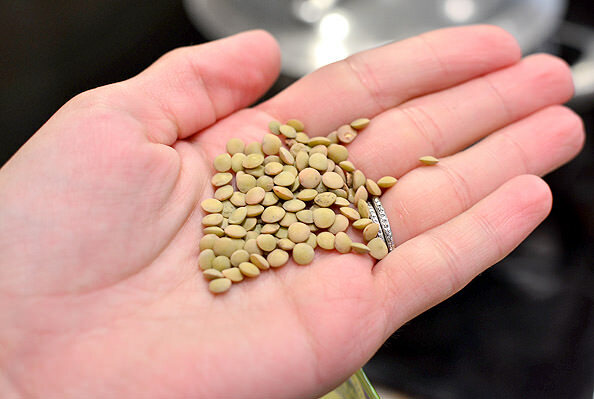 You’ll need 1/2 cup cooked green lentils, which is about 1/4 cup dry lentils. They usually take 25-30 minutes to cook but follow the directions on your individual package for the best results. I rarely if ever cook with lentils but was perusing Trader Joe’s a few months ago and randomly decided to pick up a bag. After doing some research upon my return home I was thrilled to learn that they’re packed with fiber, iron, vitamin B, and protein. Perfect for my growing toddler! 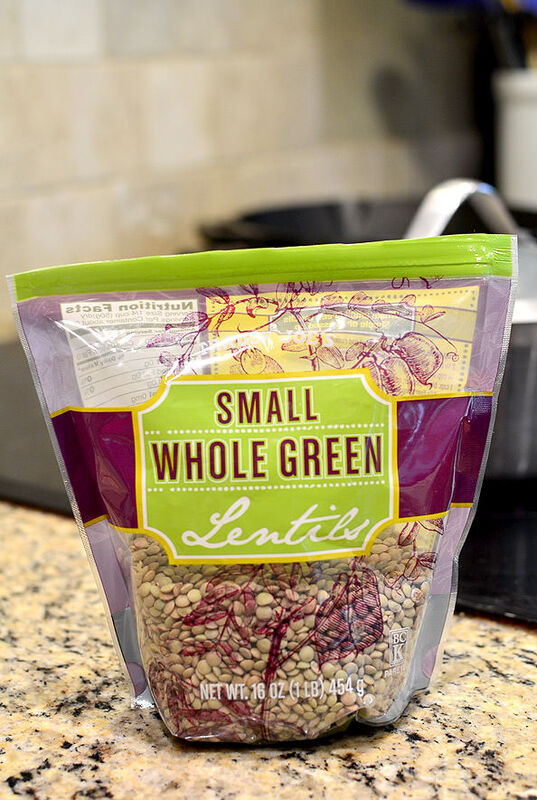 You could use any color lentils you like, but green have a reputation for holding up well to cooking without turning to mush. 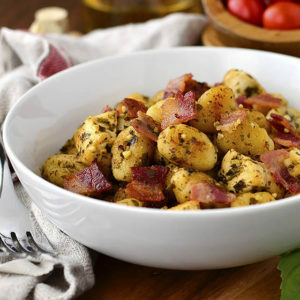 By the way, although you only need 1/2 cup for this recipe, I always cook more then freeze the leftovers which are great for adding to pasta sauce and soups. Ok, turkey time. I use a mixture of 1/2lb each turkey breast and turkey thighs. Dark meat has more iron and B vitamins than white meat, plus it adds flavor, so I like the mix. To the turkey add the lentils and 1/2 cup frozen vegetables. I use the classic frozen trio of carrots, corn, and sweet peas. Ultra-convenient and no need to thaw, either. Next add 1 whisked egg and 2 Tablespoons extra virgin olive oil. Love the boost of protein and healthy fats! Finally add 1/2 teaspoon Italian seasoning for a little flavor. You know your toddler best – if you don’t think they’ll like the seasoning, don’t add it! Mix the ingredients until just combined then scoop into a nonstick sprayed 24-count mini muffin tin. Bake at 350 degrees for 16-18 minutes or until cooked through. If you don’t have a mini muffin tin, you can use a regular muffin tin. Baking time will be more like 25-30 minutes. To freeze, cool the Mini Turkey-Lentil Meatloaves completely then place in a freezer bag and freeze. 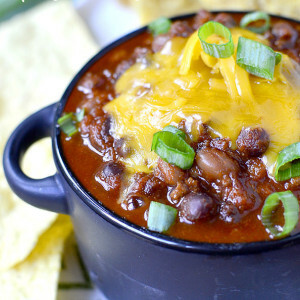 To reheat, simply microwave for 30-40 seconds! 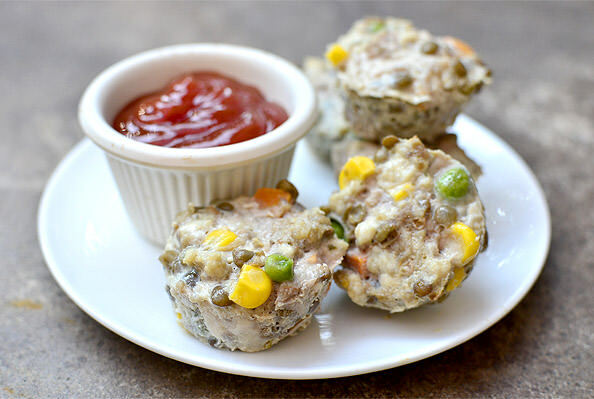 Mini Turkey-Lentil Meatloaves are packed with protein, vitamins, and iron. Gluten-free, dairy-free, and freezer-friendly too, these bites are the perfect size for little hands! Preheat oven to 350 degrees. 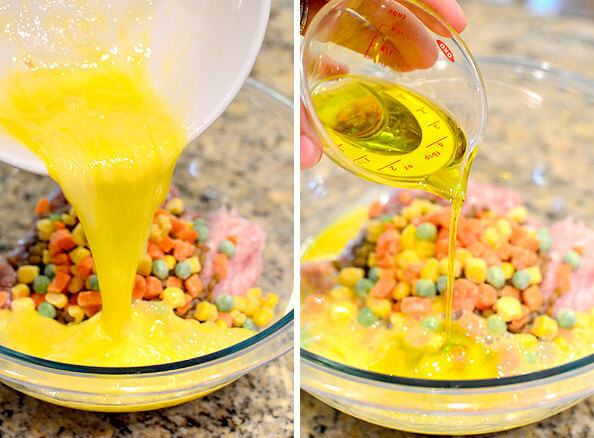 Combine all ingredients in a bowl then mix until just combined. 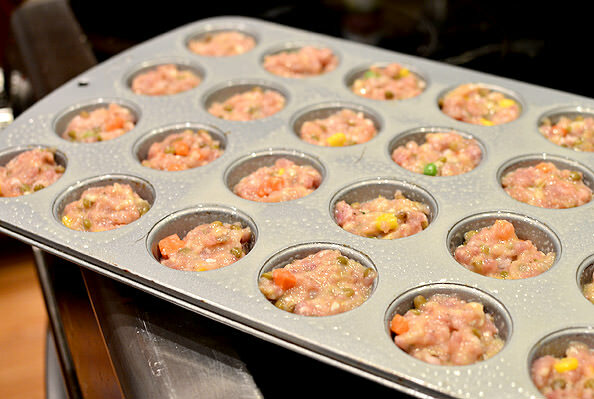 Spray a 24-count mini muffin tin very well with nonstick spray then scoop mixture to the top of each mini muffin cup. Place tin on top of a baking sheet then bake for 16-18 minutes or until cooked through. To freeze: cool baked mini meatloaves completely then place inside a freezer bag and freeze. Microwave for 30-40 seconds to reheat. Something I’ve learned is that toddlers might not like something the first time they try it, so if your toddler isn’t interested in their Mini Turkey-Lentil Meatloaves the first time, keep trying! If all else fails, add a dollop of ketchup. Works every time. ;) Enjoy! Well, since I don’t have toddlers anymore, I’m just going to have to try these myself! I love that they’re freezer friendly and portioned small so I could pull out however many I’m craving that day. Thanks for sharing the recipe! Trying these tonight! 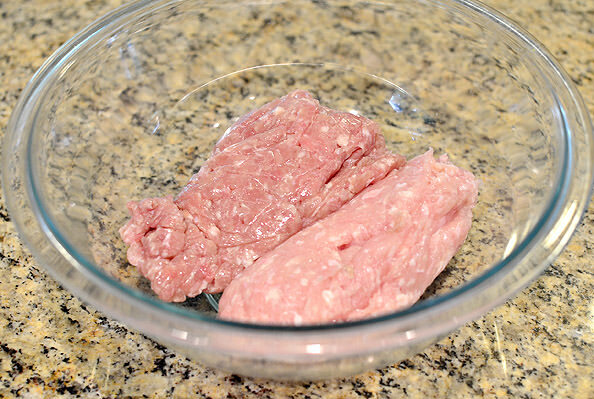 I had a pound of ground turkey out with NO idea what I was doing with it. Thanks for this timely post! I love mini meatloaves! I made a version of these with quinoa instead of lentils this summer for my step-daughter — she asked for them for BREAKFAST. Ha! I absolutely adore lentils so I’ll certainly be whipping up a batch for myself. I can tell these will be great to bring to work for lunch, also. Yay! So excited to see this recipe because I am feeling very uninspired with my little one’s meals. Looking forward to more toddler recipes! LOVE this. Printed it and cannot wait to try. Always looking for new meal ideas for the mini! Our girl loves her mini meatloaf! Thanks for a new spin on a family favorite. Hey Jill! He does like his greens/veggies (for now, anyway!) Does your daughter like smoothies? You can blend spinach up in them very easily and you can’t taste it at all. Minestrone soup is really good for masking veggies in with beans and pasta. I also do these turkey roll ups where I’ll spread turkey slices with either hummus or mashed avocado, sprinkle on chopped spinach, and then roll and slice. 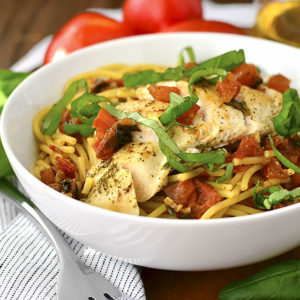 One more idea – make a spinach or kale “pesto” then toss it with pasta! 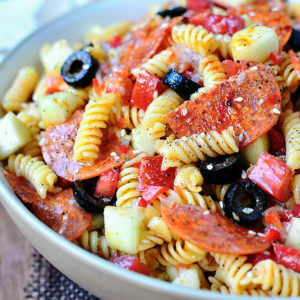 Ok, ONE more idea – a bunch of pasta companies are coming out with pastas that are made with veggies (a serving of pasta = a serving of veggies,) so if all else fails you could at least feed her some of that with pasta sauce or olive oil! I hope that helps! So excited to try this recipe! My son is 13 months and I know he will love these. Thank you, thank you! I am looking forward to more toddler recipes that are freezer friendly – so convenient! We try to have him eat what we have for dinner, but with both of us working full time, we can’t always get dinner on the table before he goes to bed. These are perfect. Thanks again!! Thank you for this recipe! I have a 2.5 year old who would love these! 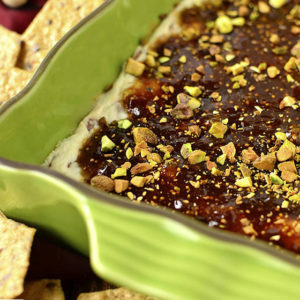 Anything he can dip in ketchup or bbq sauce is always a win! I am a vegetarian and really struggle to find meals with meat that I feel comfortable cooking for my toddler, so I feel like I use so many “convenient” meats for him and even when buying them organic it doesn’t feel great just to give him frozen chicken, hotdogs, and lunch meat. Especially now with another on the way I am so so excited to try these out! They look super easy and I think my little guy would like them a lot! Thank you!! Please keep posting toddler meals. My little one is about a month younger than Lincoln, I am always looking for new ideas for food, especially ideas to send to daycare. Love this!! Going to try it for my 1 year old (shed a tear, he’s already 1!) I love that you are posting more toddler foods. Can’t wait to see what you come up with next! Yeah… :( You could try adding shredded cheese to help everything “stick” together, otherwise you could leave the egg out and just know they might be a bit crumbly? These look perfect, my 18 month old is also dairy free. I’m always on the lookout for food ideas for her. Thanks for sharing a toddler recipe! Love the toddler recipe! So excited to make these soon when our 10 month old gets a little older! Thanks for sharing! Thank you for this recipe!! Our little guy is also eating much of the same things we are eating at dinner but these are PERFECT for his daycare lunch rotation!! 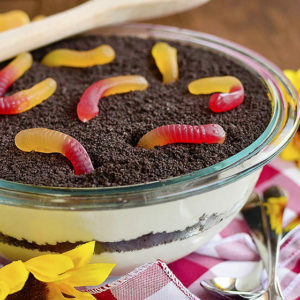 Can’t wait to try making them this weekend. Thank you!! My 11-month old will LOVE these! The real test will be if my picky 3-year-old will try them, too. :) Thank you! Thank you for this great recipe! My daughter isn’t too far behind Lincoln age-wise (she’s 13 months), so I’m loving any and all toddler recipes! I feel like we are stuck in the same rut and would love to feed her some new recipes. This is a great way to incorporate protein and veggies. We try to feed our son what we are eating, but sometimes if we want spicy-ish food or stir-fry (too salty) or he just doesn’t like what we feed him, then these would be a great alternative. I will have to try them this weekend for my 13.5 month old. Thanks for the recipe. Do you have any suggestions for breakfast? We are still giving him oatmeal, not baby oatmeal (Quaker or Better Oats) because it is easy or Toast with a bit of jam and fruit, but I feel like he is eating the same things for breakfast and we are in a rut. We have the opposite problem. Our girls LOVE breakfast (even if it is the same things over and over again) but are rebelling against lunch especially and now dinner. Some good breakfast suggestions that have worked here? Pancakes and mini muffins that you make yourself! I’ve made both with shredded carrots and zucchini, chopped apples or plums and applesauce to boost the nutritional content because my girls are hating their fruits and veggies right now. Good luck mamas! I’ve been trying to come up with more healthy quinoa or lentil bites for my toddler and these look perfect. I don’t have a mini muffin pan so I’ll try them as full muffins and see how they turn out. I made these for my 13 month old last night, and he LOVES them. I added black olives and parmesan cheese. Made these for myself. Very handy to pop a few in the microwave as part of breakfast or use for a roadtrip snack. They are 1 WW point a piece (may add up to more depending on how many you eat). I’ve made these many times and they’ve always turned out great! However, I’m wondering if there’s an easier/quicker way to prepare them? I find myself standing there waiting for everything to come to the same temperature so I can mix it. Sometimes it’s still too cold from the frozen vegetables to my egg hardens and sometimes the egg becomes a scrambled egg because the lentils are still too warm! These sound good, but any idea of how many calories, fat, carbs, etc? Please help me as I am a diabetic looking for small meals. My toddler would love these! However, she’s allergic to dairy and egg – what would you recommend in place of the egg for this recipe? Thanks! Is there a way to bind this without the egg (egg allergic toddler here)? I would try shredded cheese – any kind. Just make sure to spray the muffin tins really, really well with nonstick spray! Could I swap out lentils for quinoa?